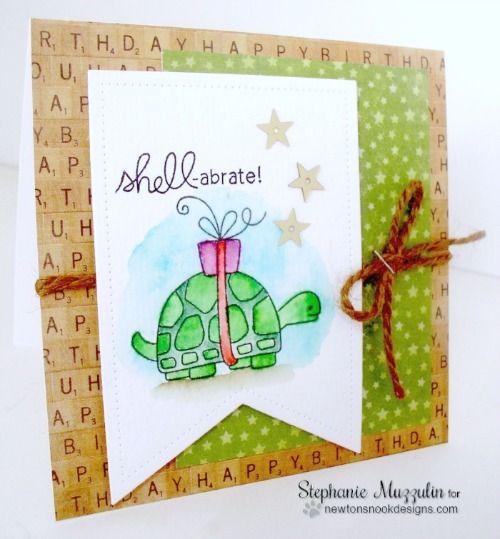 Today we have a fun turtle birthday card by Stephanie! She used that fun turtle with the gift on his back from the In Slow Motion stamp set and colored him with watercolors. So pretty! The "shell-abrate" sentiment is also from the In Slow Motion stamp set! I love the fun Scrabble letter Happy Birthday paper - it's quite fitting since Scrabble is a fairly slow game! LOL! If you like this turtle card, make sure to check out our In Slow Motion stamp set - it's filled with slow animals including a turtle, sloth and snail! Thanks for the inspiration today, Stephanie! To see more of Stephanie's work you can visit her blog, Handmade Creations by Stephanie!